In a game that features two 0-2 teams the New York Giants and Houston Texans clash at NRG Stadium in what could be considered an early must-win game for both franchises. For the Giants, it all starts with the offensive line as they have had big issues up front early in the season and their challenges don’t get any easier as they travel to Texas. 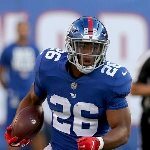 To succeed against the Texans aggressive defense this week there must be better communication between the Giants linemen all across the board. The struggles of the Giants offensive line has led to sacks and problems running the ball and if this continues players such as the Texans’ JJ Watt and Jadeveon Clowney will have a field day. Also, the Giants must allow Saquon Barkley rushing game to lead the way against the Texans as this would help New York’s struggling offensive line, which has done a poor job protecting Eli Manning. Running the ball would allow the Giants to operate off play action much better as the defense of the Texans would not be able to focus on and be as aggressive when pressuring the quarterback. Plus, Barkley’s explosiveness makes him a threat to score on any given play and from anywhere on the field. But the Giants are not the only team with offensive line struggles. The Texans’ unit must also step up their game as they have already given up eight sacks in their first two games of 2018. The Texas offensive line must play better on the interior as the Giants are stronger down the middle of their defensive line with Damon Harrison and Dalvin Tomlinson leading the way. Opening lanes for running back Lamar Miller and creating pocket space for quarterback DeShaun Watson to operate would go a long way in helping the Texans win this matchup, but for that the Texans defensive line will have to find a way to immediately provide better run blocking and cut back on the number of sacks they allow per game (four). Although both teams have similar struggles, offensive line issues and a lack of a dangerous running game, expect the Houston Texans to come out on top as they are at home and have a more aggressive defense that will create havoc on the Giants offensive frontline and that should be enough to carry them to victory on Sunday.